Subscriber and view counts updated as of December 2016. Joseph Michael "Joey" Graceffa (/ɡrəˈsɛfə/; born May 16, 1991) is an American YouTube personality, actor, author, producer, and singer. He has two active YouTube channels, both of which are named after him. One of them is for vlogging and the other is used for video gaming content. They both have a combined total of more than one billion views. His other YouTube channel, which he no longer uses, called WinterSpringPro, has 64 million views (as of December 2016). He was a contestant on 22nd and 24th seasons of The Amazing Race and has appeared in short films (as web films) and short web telvision series on YouTube and its subscription-only service YouTube Red. Graceffa was born in Marlborough, Massachusetts, the son of Debbie O'Connor and Joe Graceffa. He has two siblings, an older sister named Nicole and a younger half brother named Jett, through his mom and his stepfather, Bob. Jett has, according to Graceffa, been diagnosed with autism when he was very young. Graceffa's endured hardships with his mother when she resorted to alcoholism and drug abuse due to good changes in her life she wasn't used to starting at age 12. He graduated from Marlborough High School in 2009. Graceffa enrolled in Fitchburg State College intending to major in film, but left after one year. Graceffa initially intended to enroll in Emerson College, a private, liberal arts university in downtown Boston, Massachusetts, but was rejected twice, so he decided to stay at Fitchberg. 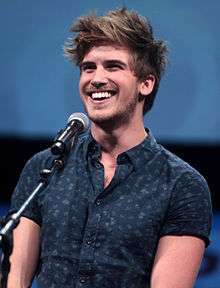 At age 16, Graceffa began uploading videos to YouTube on a channel known as WinterSpringPro, with his high school classmate and friend Brittany Joyal in 2007, when Graceffa was in high school. In 2009, he started posting videos on his own channel, called, JoeyGraceffa. In 2013, he joined the StyleHaul YouTube network. Graceffa posts daily vlogs on his channel. As of November 2016, he has over 7 million subscribers and more than 1 billion total views on his main YouTube channel. On a second YouTube channel focusing on his gaming, he had more than 2 million subscribers and over 330 million views, for a total of over one billion views. He also has more than 3.4 million Twitter followers and more than 4.8 million instagram followers. In 2013, Graceffa and fellow YouTube personality Meghan Camarena were contestants on The Amazing Race 22. The two made it to the tenth leg before being eliminated. Graceffa told an interviewer that "There were a lot of bad times but it was definitely good overall. It was an amazing experience, and I'd love to do it again." The two later teamed up again to compete in The Amazing Race: All-Stars. In late 2013 and early 2014, Graceffa starred in his own web series titled Storytellers. In 2014, Graceffa starred in his own short film titled Eon. The same year Graceffa also starred in Ethereal alongside Joey Pollari. Throughout 2012 to 2014, Graceffa was in various BlackBoxTV short films. He was also a part of the Fine Brothers online series MyMusic throughout 2013 and 2014. Graceffa was nominated for two awards at the 2014 Teen Choice Awards. He won "Best Male Actor in a Dramatic Web Series" at the 2014 Streamy Awards for his portrayal of Hunter Crowley in Storytellers. Graceffa was named by Common Sense Media as one of "10 YouTube Stars Your Kids Love". In March 2015, Graceffa starred in an episode of the CONtv reality television project Fight of the Living Dead, created by fellow YouTube personality Justine Ezarik. On May 16, 2015 Graceffa released a song with an accompanying music video titled "Don't Wait" that was widely distributed on Twitter and other media to broadly positive comment. It tells a fantasy fairytale story that features goblins, a witch and a prince. The video ends with Graceffa, dressed as a prince, kissing his male co-star. By October 2016, it had received more than 24 million views. Graceffa confirmed on YouTube on May 18, 2015 that he is gay. Graceffa stated that the reason he waited so long to come out online was because "there was a lot of hesitation to come out online because of growing up in my town: It wasn't acceptable to be gay; it was looked down upon." He also went on to state that after coming out, "I definitely feel more open and free with who I am, and I think that's inspired a lot of other people to also do the same and have come out to their friends and family." On May 19, 2015, Graceffa released a memoir titled In Real Life: My Journey to a Pixelated World, published by Keywords Press. In the book, he discusses being bullied and feeling lonely in school, his mother's alcoholism, his brother's autism, the beginnings of his YouTube career and his road to self-acceptance, among other topics. His book was a New York Times Best Seller on the "celebrities" list in July 2015 and the cover was updated to acknowledge this achievement. On June 21, 2016, Graceffa announced in his YouTube video entitled "I HAVE A SURPRISE! ", that he is starting a crystal-based jewelry line, called "Crystal Wolf". On June 22, 2016, Graceffa started, starred, and uploaded the first episode of a YouTube Red mini-web series called Escape the Night with other YouTubers like Shane Dawson, MyLifeAsEva, Glozell, Oli White, Timothy Delaghetto, Andrea Russet, Matthew Hagg, Justine Ezarik (iJustine), Sierra Furtado, and one Viner, Lele Pons. The first episode has over 8,000,000 views. On October 4, 2016, Graceffa, along with co-author Laura L. Sullivan, released a young adult novel titled Children of Eden, published by Keywords Press. The book follows a Second child named Rowen, who is marked with death due to Eden's population control and recklessly escapes for an adventure after sixteen years of hiding. His book was a New York Times Best Seller on the "Young Adult Hardcover" list in the week of October 23, 2016. The book has received glowing praise from readers on Goodreads and Amazon, with four and five star reviews predominating. Critics have not been universally positive, although Rachel Hyland of Geek Speak Magazine wrote, "Graceffa knows a lot about YA dystopian conventions, and they are all present and accounted for here. This is by no means a bad thing — an enjoyable romp through this genre doesn’t necessarily require too much divergence (no pun intended) from the established norms — but it is worth noting that most everything in his Eden has pretty much happened before, in one way or another. Still, it is fun to see just how those ever-trusty elements are put together, and there is a nice twist on the almost essential love triangle that is actually pretty awesome." Children of Eden Ash Short film; also served as writer and producer. 2015 Huge on the Tube Episode: "Joey Graceffa"
2015 Fight of the Living Dead Himself Episode: "Pilot"
2012 "We Are Never Ever Getting Back Together"
On February 14, 2016, Graceffa confirmed he is in a relationship with Daniel Preda. The pair have been together since July 2014. He lives in Los Angeles, California along with Preda and their two husky dogs, Wolf and Storm. ↑ "Famous Birthdays Today, May 16: Megan Fox, Joey Graceffa, Janet Jackson, Pierce Brosnan, Kelly Hyland, Tori Spelling". Yareah Magazine. Retrieved January 2, 2015. ↑ "Joey Graceffa". YouTube. Retrieved September 1, 2016. ↑ "WinterSpringPro". YouTube. Retrieved September 1, 2016. 1 2 "Marlborough teens are a hit on YouTube". Wicked Local. October 29, 2009. Retrieved October 7, 2014. ↑ "Marlborough High School Class of 2009". MetroWest Daily News, Framingham, MA. ↑ Graceffa, Joey. "Draw My Life – Joey Graceffa". YouTube.com. Retrieved October 7, 2014. ↑ Blattberg, Eric. "Meet the YouTube 1 percent". Digiday. Retrieved January 2, 2015. ↑ "YouTube Star Joey Graceffa Joins StyleHaul". Tubefilter. Retrieved May 17, 2015. ↑ Graceffa, Joey. JoeyGraceffa, YouTube, accessed January 9, 2016; and Graceffa, Joey. "Joey Graceffa", YouTube, accessed January 9, 2016. ↑ "YouTube personality Joey Graceffa to compete in 'The Amazing Race'". Hypable. Retrieved May 17, 2015. ↑ CBS. "The Amazing Race – Meet Joey and Meghan". YouTube.com. Retrieved May 17, 2015. ↑ "'Amazing Race': Joey and Meghan on Their Elimination". The Hollywood Reporter. Retrieved May 17, 2015. ↑ "Amazing Race 24: All-Stars Cast". CBS. Retrieved May 17, 2015. ↑ Wilken, Selina. "Featured web series: Storytellers is high-tension, imaginative storytelling". Hypable. Retrieved May 18, 2015. ↑ Varrati, Michael. "Storytelling with a Superstar: A Conversation with Joey Graceffa". The Video Ink. Retrieved October 7, 2014. ↑ Patel, Sahil. "Joey Graceffa Stars in New Short Film 'Eon'". The Video Ink. Retrieved October 7, 2014. ↑ Nordyke, Kimberly. "Teen Choice Awards: The Complete Winners List". The Hollywood Reporter. Retrieved May 17, 2015. ↑ "Winners Announced for the 4th Annual Streamy Awards". Streamys.org. Retrieved May 17, 2015. ↑ Knorr, Caroline. "10 YouTube Stars Your Kids Love". Common Sense Media. Retrieved May 17, 2015. ↑ Vejoda, Jim. "Fight of the Living Dead Trailer Debut". IGN. Retrieved May 18, 2015. ↑ Beard, Lanford. "iJustine Previews Zombie Reality Competition Fight of the Living Dead". People. Retrieved May 18, 2015. ↑ Graceffa, Joey (May 16, 2015). "Don't Wait – Official Music Video". Retrieved December 30, 2015. ↑ DeSimone, Evan. "Joey Graceffa Comes Out In New Music Video". New Media Rockstars. Retrieved May 17, 2015. ; and Lord, Emma. "Joey Graceffa Came Out In His Music Video For "Don't Wait," And It Is Basically the Millennial Fairy Tale We've All Been Waiting For". Bustle. Retrieved May 18, 2015. ↑ Nelson, Jeff. "YouTube Star Joey Graceffa on Coming Out: 'I Felt Like I Was Hiding Such a Big Part of My Life'". People. Retrieved June 4, 2015. ↑ "In Real Life - Joey Graceffa". JoeyGraceffa.com. Keywords Press. October 14, 2016. ↑ "Authors: Joey Graceffa". Simon & Schuster. Retrieved May 17, 2015. 1 2 "Best Sellers - The New York Times". www.nytimes.com. Retrieved November 29, 2015. ↑ "Joey Graceffa on Twitter". Twitter. Retrieved November 29, 2015. ↑ "Our Love Story!". YouTube. Retrieved February 14, 2016. ↑ Pearl, Diana (2016-02-14). "YouTube's Joey Graceffa Introduces His Boyfriend for the First Time". People (magazine). Retrieved 2016-04-09. ↑ "I Have A Surprise!". YouTube. Retrieved August 2, 2016. ↑ "Crystal Wolf". Retrieved October 5, 2016. 1 2 "Children Of Eden - Joey Graceffa". JoeyGraceffa.com. Keywords Press. October 13, 2016. ↑ Hyland, Rachel. "BOOK REVIEW: Children of Eden by Joey Graceffa". Geek Speak Magazine. Retrieved 15 October 2016. ↑ "iTunes - Music - We Are Never Ever Getting Back Together - Single by Luke Conard & Joey Graceffa". iTunes. ↑ "iTunes - Music - Kiss You - Single by Luke Conard & Joey Graceffa". iTunes. ↑ "iTunes - Music - Anna Sun - Single by Joey Graceffa". iTunes. ↑ "iTunes - Music - Story of My Life - Single by Joey Graceffa & Luke Conard". iTunes. ↑ "iTunes - Music - Collar Full - Single by Joey Graceffa". iTunes. ↑ "iTunes - Music - Silver Lining - Single by Joey Graceffa". iTunes. ↑ "iTunes - Music - Don't Wait - Single by Joey Graceffa". iTunes. ↑ OUR LOVE STORY!. February 14, 2016. Retrieved February 15, 2016 – via YouTube. ↑ "Joey Graceffa on Twitter". Twitter. Retrieved February 15, 2016. ↑ Phillips, Hedy (March 4, 2016). "Joey Graceffa and His Rescue Pup Have the Most Adorable Bond". www.popsugar.com. Retrieved 2016-07-09.